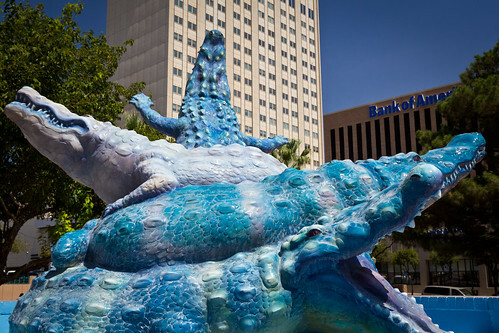 At the center of Jan Jacinto Plaza is a Luis Jiménez sculpture titled “Plaza de los Lagartos.” The piece pays homage to the parks unique history, once being the home to live alligators. The tale of the alligators is a sad one. Three were added to the park in the late 1800’s and were the main attraction for decades. Unfortunately they were frequently targeted by vandals until they had to be permanently removed from the park. Their last appearance in the park was in 1974. 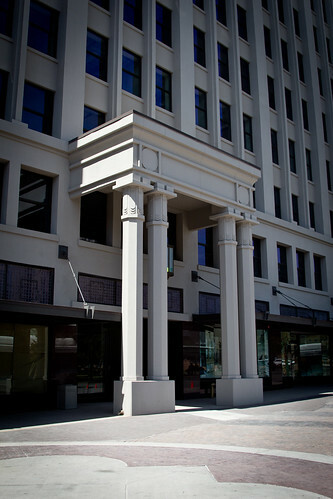 The sculpture was part of a mid 90’s attempt to revitalize the downtown area. It originally was more kinetic, featuring water fountain and misting elements. Currently the fountain has been drained and the water features turned off. The ever present desert sun has faded the fiberglass sculpture quite a bit. 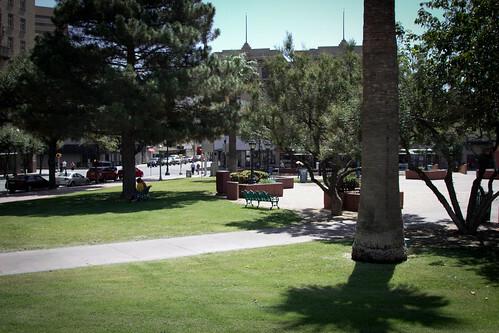 San Jacinto Plaza had served as the Sun Metro transportation hub for the Downtown area. This lead to an abundance of people waiting in the park for the bus as well as pan handlers and vagrants who slept in the grassy areas. To prevent that, the grassy areas were fenced off making the park not very park like. Recently Sun Metro has moved the hub and now the park is rather empty. The revitalization bug has once again been caught by city council so to make the park more people friendly, the city has removed the fencing surrounding the grassy areas. 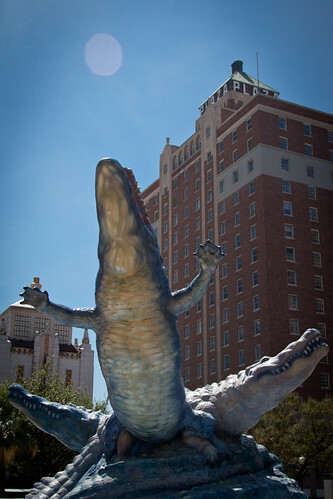 The alligators now have their own Facebook page (Los Lagartos) in protest to the redesign and others around the city have voiced concerns as well. I agree that a redesign should include some elements from the parks past. Jimenez’s sculpture could be refurbished and better incorporated into a water feature prominently drawing from the parks historical significance. If removal is still in the cards, then one would hope that any reuse of the sculpture doesn’t wind up being an affront to the original artist intent. 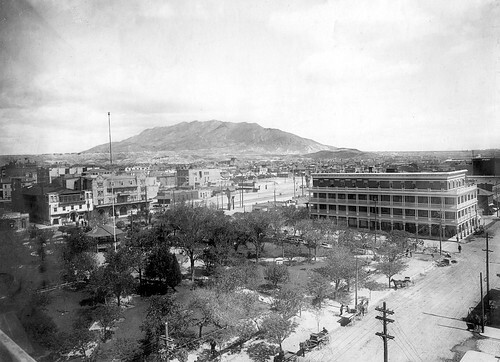 That’s the one thing that El Paso really has going for it, architectural history. After being largely neglected but left intact, we are finally waking with the desire to improve our downtown. We should resist the attempts to go whole hog modern, we are never going to be “that city”. Lets move forward by better using what we have.